Msgr. 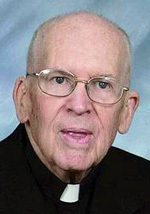 John P. Boland, 86, who served as pastor of St. Rose of Lima Parish in North Wales for two decades, died May 7. Msgr. Boland was born in Philadelphia, the son of the late John Patrick Boland and the late Beatrice C. (Murphy) Boland. He attended St. Helena School and La Salle College High School before entering St. Charles Borromeo Seminary. He was ordained May 19, 1955 by Archbishop John F. O’Hara at the Cathedral of SS. Peter and Paul and after a summer assignment to the Convent of the Holy Child, Sharon Hill, he was sent to the Diocese of San Juan in Puerto Rico, in preparation for Hispanic ministry. After that he was appointed consecutively as parochial vicar St. Edward the Confessor, St. Malachy and St. Elizabeth parishes in Philadelphia; St. Francis de Sales, Lenni; St. Michael, St. Thomas Aquinas, Visitation B.V.M. and St. Christopher, Philadelphia. In 1984 he was appointed pastor of St. Rose of Lima and named pastor emeritus in 2004. During his tenure an addition was added to the school and a gymnasium built as well as improvements made to the church, “but everyone was willing to help out, because they respected him so,” Diebold said. In retirement Msgr. Boland returned to St. Christopher where he remained in residence almost until his death. At St. Christopher, a Sunday, May 15 viewing for Msgr. Boland was held at 4 p.m. followed by a 6 p.m. Mass with Msgr. Garvin as celebrant. On Monday, May 16, St. Rose of Lima hosted the 10 a.m. viewing followed by a 12 noon funeral Mass celebrated by Archbishop Charles J. Chaput. Concelebrants included Msgr. Graham and Fathers Edmond Speitel, Thomas Gardner, Francis X. Herron, Francis X. Kelly, Wilfred Maloney, John Schiele and Francis X. Barrett, and Msgr. Garvin, who was the homilist. Msgr. Boland is survived by his sister-in-law Kathryn W. Boland, his nieces Trici Boland, Kitty Hill, Sara Boland Trapanier, Angela Boland, Genevieve Boland and nephew Jim Boland Jr., and great nieces and great nephews. Interment was in Holy Sepulchre Cemetery, Philadelphia.